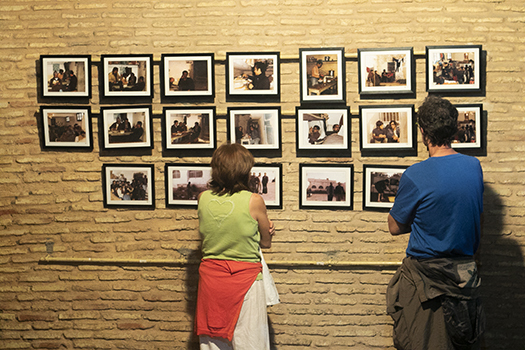 Tunis, September 24, 2018—On Saturday, the International Center for Transitional Justice and the University of Birmingham launched Voices of Memory, an interactive exhibition inspired by a group of nine Tunisian women from across the country and from different generations. It is the first collective testimonial of Tunisian women who experienced the impact of repression under the Ben Ali regime. A diverse audience of 150 Tunisian residents attended the long-anticipated opening of the exhibition. Attendees were also joined by national and international representatives, including Carol McQueen, the Ambassador of Canada to Tunisia, Louise de Sousa, the British Ambassador, and Teresa Albero of the Office of the High Commissioner of Human Rights in Tunisia. The participatory art project, which has been over a year in the making, uses several mediums to communicate these women’s stories in an effort to raise public awareness and catalyze discussion about the relevance of these past experiences on Tunisia’s present and future. A unique museographic experience incorporating illustrated narratives and written testimonies, as well as soundscapes and audio recordings, the project is also the first artistic collaboration of its kind in Tunisia. Marouen and Taieb Jallouli designed the scenography, with lighting by Ahmad Bennys, sound by Wissam Ziadi, and contemporary works by several Tunisian artists. In an effort to inspire visitors to envision a more just future for Tunisia, the women chose as the central motif for the exhibition the “Koffa,” the traditional Tunisian basket used to bring food to political prisoners. The Koffa, generally prepared with love and loaded with unwritten messages, was often arbitrarily denied to prisoners. It thus represents a loved one’s offering and a protest to forced separation. As visitors walk through the exhibition, they experience the sights, sounds, and even smells of a prison cell. In a designated reflection room, those witnessing the exhibit are encouraged to share and record their own stories of confinement or repression. Through this distinctively interactive experience, the project engages citizens in a dialogue about the universality of women’s experiences. Ultimately, it seeks to build a bridge between generations, genders, and political and social divides, reminding Tunisians of the humanity of the other, and the equality of all citizens. “This exhibition asks us to reflect on what kinds of stories we focus on when we talk about legacies of harm both in Tunisia and the world, what experiences we consider significant enough to tell,” remarks Dr. Christalla Yakinthou, of the University of Birmingham. Together with ICTJ, the university served as a key implementing partner for the project. The Voices of Memory exhibition is made possible by the generous support of the Government of Canada, the Grand Duchy of Luxembourg, the University of Birmingham, and the Economic and Social Research Council’s Impact Acceleration Account.